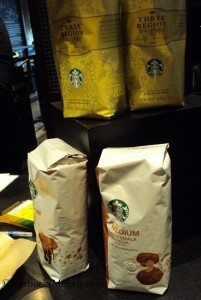 Three Region Blend coffee returns to Starbucks on May 1, 2012: Sneak preview coffee tasting. 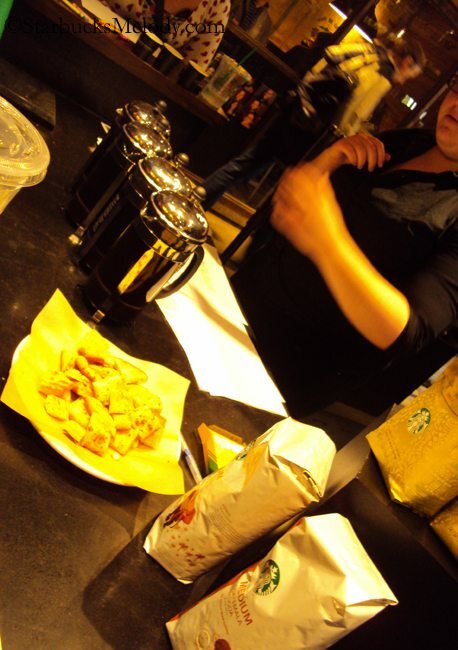 Tonight (April 16, 2012) I went to a little coffee tasting for Starbucks Three Region Blend coffee. I gained a new appreciation for this coffee. I wasn’t feeling so excited about this blend until tonight’s event. Honestly, I’d simply forgotten how good this coffee is. Three Region Blend is a fully washed-processed coffee, and combines beans from Guatemala, Tanzania, and Papua New Guinea. The coffee beans are all roasted together to make a perfect flavor – this is also known as a “pre-roast” blend, when the blending occurs before the roasting process starts. This coffee is actually the first coffee where Starbucks experimented with blending beans from all 3 growing regions. This coffee was originally launched in 2010. It works well iced or hot. One thing I thought was interesting, tonight I learned that this coffee was launched with springtime in mind: for these three regions, the coffee beans are best picked in the spring. 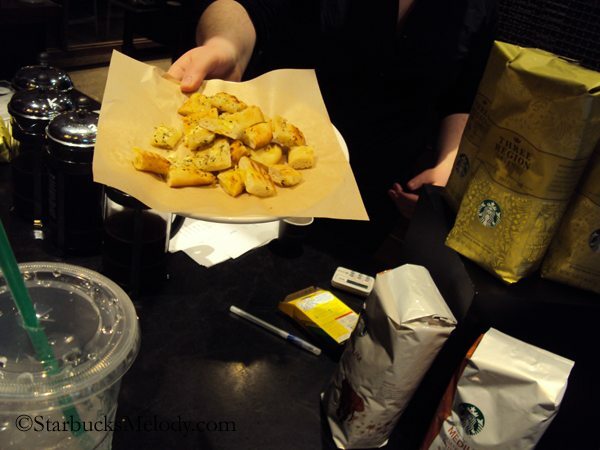 Tonight’s coffee tasting was held at the Olive Way Starbucks, and hosted by coffee master-in-training, Megan. 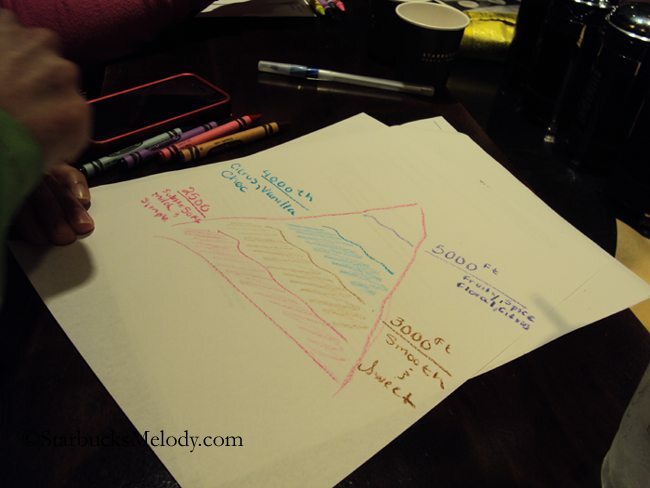 We started with a short activity of learning about how elevation affects the flavor of a bean. 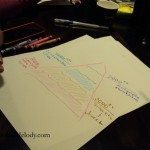 We drew out the “Elevation Triangle” and so I snapped a photo of my neighbor’s triangle, which looked much better than mine (It is attached in the photos below). The overwhelming majority of Starbucks coffees are sourced from high elevations, above 5,000 feet. I learned that Kona is one of the few low elevation coffees sourced by Starbucks. 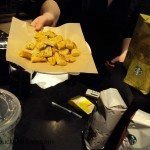 The food pairing was the Starbucks Mediterranean flat bread which is considered an “elevated” offering and only available at a limited number of stores. The idea was to bring out the savory notes with the flat bread. Indeed, I was impressed and discovered that the savory notes of the Papua New Guinea do come out stronger when paired with this savory bread. We had a lot of fun at this coffee tasting, and I definitely recommend that you get to an Olive Way coffee tasting! The next one will be on April 30, 2012, and a coffee master will be walking us through the newest Reserve coffee offerings. The Olive Way coffee tastings are every other Monday night at 6:00 p.m., and they are open to the public, and free to attend. Please come join us there! 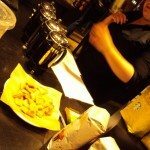 By the way, for more blog articles on coffee tastings, click here. You should know the stories that go with the coffee. Where are all the Starbucks Clover stores? I would have loved to attend this coffee tasting or for that matter any coffee tasting. I have yet to find one around here certainly my local SB has not done one. I particularly like that they do the tasting with a food pairing. My local Starbucks randomly had about 6 bags of the 2012 Three Region Blend about two weeks ago (it was April 5th, actually) and I quickly grabbed a bag! The partner who rung me up was surprised to see it (as was I), and there were none left by the time I went in again. It’s good to hear that they’ll be having more soon, as I really enjoyed the bag! PS: Does anyone know how long in the future they print the “For fresh-roasted flavor…” from when it’s roasted? What I mean is.. the bag I bought had a ‘date’ of November 3, 2012. Is there any way to know, based off that, when it was roasted? Because I have to say that it was some of the freshest-tasting coffee I’ve ever had from Starbucks! 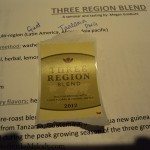 I was able to get some of this years Three Regions Blend earlier in the week. I was a little disappointed with it. I was getting a strong taste, but I wasn’t tasting any cocoa flavor from it. I will wait until May 1st to give it another try. Maybe my palette was a bit off that morning. @Tyler G – I’m surprised you were able to buy it. It’s been in store here for over a week, but like Tribute that arrived a month early, it’s a no no to sell it before the date set to introduce it for sale. @Tyler G – The ‘sell by’ date on the bags varies by roast, but most of them are 180-270 days, so about 6-9 months. I don’t know which number Three Region leans towards, but based on the info we get periodically from the roasting plant, I’d guess it’s closer to 6 months. I think they started roasting Three Region in Kent sometime in March. How does 3 Region compare to Tribute (isn’t Tribute also a 3 region blend)? @MagicKat – I haven’t heard that before. Don’t know if it has changed, but your answer makes a lot of sense. I remember once several years trying to figure out what the “roasted” date would be from the packaging, and I think one ssc partner gave me a maximum number of weeks from the expiration date it would have been roasted – In other words, I figured that the roast date was some number of weeks back from the expiration date. Problem is I don’t remember that exact number, but I remember thinking it was just under 8 months. So something like 7 months and 3 weeks – It was an odd number. But heck, your answer makes more sense, and I can easily see that French Roast might be 9 months, but I lean towards thinking that between 7 and 8 months is right. Sorry for the long confusing answer. @CD – Tribute is a much more complex coffee in every way, and very different flavor profile. Tribute has beans with all process methods, such as sun-dried, semi-washed, and washed, whereas 3 Region Blend is an all washed coffee. Tribute includes Aged Sumatra and Sun Dried Yirg both of which tend to be very dominate flavors. I surprisingly didn’t care much for the 3 region blend when I first bought it (2010) so am not thinking I’d like this yrs any more. It was overall just too ‘light’ for me, and yes, I’d call it a medium blend. Used to have that pretty packaging tho…. I thought they had discontinued coffee stamps? What this has to do with 3 Regions Blend is my thought that the focus on K Cups, Via, Howard Cups and whatever new “quicker but more expensive” delivery options has done to the whole bean sales. 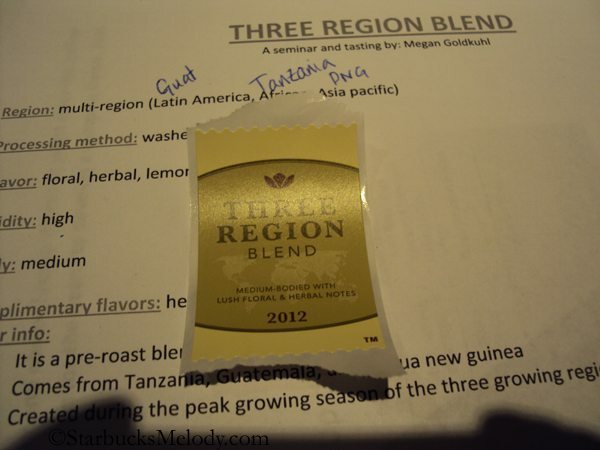 I got to try the 3 Regions yesterday…My local starbucks had bags last week and I picked one up. I didn’t care for it hot but My friend has a cold drip system and we tried it that way & I love it. Don’t know why but it tastes WONDERFUL COLD & I just didn’t get that when I pressed it hot? Also they have a reall different mug to go along with the blend. (tubmler too) both available on SBux.com right now. I like the mug though. Only $9.00 & it’s 14oz. It’s my NEW FAV. 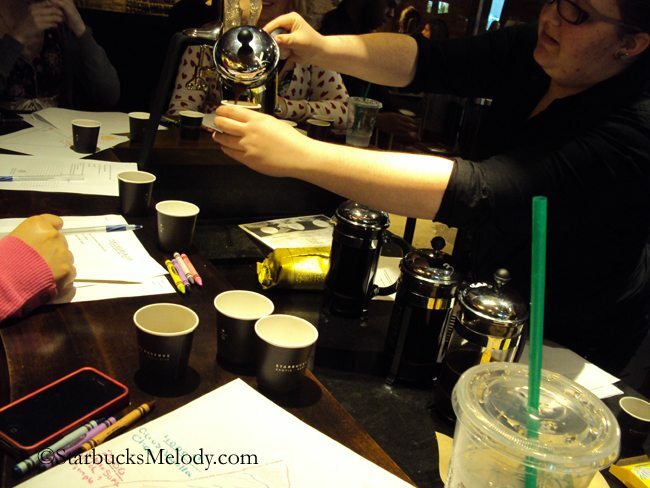 @Melody – Have you tried the Malawi and / or the Organic Galapagos yet? I liked them both, but I really liked the Malawi. @Chgo – Yes I have! I was sitting at a Starbucks late afternoon, and it was very slow, and a partner whom I really like said he was going to make a couple of french presses of the new coffees (since they’re not programmed into the Clover yet.) Thoroughly enjoyed the experience. 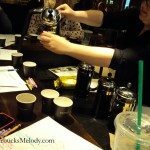 We walked through a quick coffee tasting – aroma, slurp, locate, and describe, and I was with you that I totally liked the Malawi. Can’t wait to have it again. @Chgo. As of this morning both are programmed into the Clover, at least at my store, so this shouldn’t be a problem in the future. I am very excited to taste this year’s batch of the Galapagos, as I quite enjoyed the roast last year. I tried the Three Region blend last year and wasn’t impressed as it was too bland compared to the darker roasts Starbucks offers. I got my bag of Galapagos in the mail today and WOW…I was blown away by the mouth feel of the cocoa notes and berry flavor and I must say it is WORTH the cost for the outstanding flavor that lingers on the tongue. I will definitely buy more as my budget allows and it will be on my list of favorites and it makes me want to try the other reserve coffee offerings.